This is the most accurate method of measuring the flow in medium sized streams. The weir is built like a dam across the stream, which causes all the water to flow over a rectangular notch of known dimensions, see figure below. The weir is best constructed with timber and made watertight with sandbags, sods or clay. Before building the weir, take an approximate measurement of the stream, and see that the overflow notch is sufficient to take maximum flow. The notch should have a width to height ratio of at least 3:1, and be perfectly level and sharp edged. 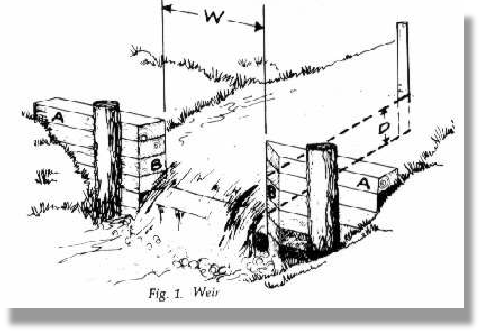 To measure the depth of water flowing over the weir, drive a stake in the stream bed three or more feet upstream from the weir, to a depth such that a mark on the stake is exactly level with the bottom of the notch "B". Measure the depth "D" in inches of water over the mark, and read the volume of flow in cubic feet per minute per inch of notch width from the table. Multiply this volume by the notch width in inches, to obtain the total stream flow in cubic feet per minute. A weir is 3 ft. 6 in. wide and the depth of water at the stake is 10 inches. The flow in cubic feet per minute is therefore 42 X 12.7 = 533 cf/m. Once the weir is constructed it is a simple matter to take frequent readings.